1	3	Do Yourself a Favour Forgive	In Stock - Order before 4pm for same day dispatchWant it on Wednesday 24 April? Unload the weight of forgiveness from your shoulders with Joyce Meyer's sympathetically written guide to learning to forgive, and be forgiven. Want to be freed from the past? Joyce Meyer's insightful and compassionate book gives you the tools to unshackle yourself from the past by learning to forgive, leaving you free to live in God's love and in healthy relationships with those around you. Learn the importance of forgiving and understand its positive impact on the roots of bitterness and anger. 'Do Yourself a Favour - Forgive' is Joyce Meyer's guide to navigating that thorny territory between bitterness and anger and finding true peace. Joyce Meyer explains how forgiving is the only thing that can free you from the terrible turmoil that follows when you allow your anger and bitterness to get the better of you and spill over into every part of life. Christians are taught from childhood that good Christians don't get angry. Joyce Meyer argues that anger is especially hard to handle for Christians to handle but that's not a reason to let anger destroy our well-being and health. Joyce Meyer describes how anger is responsible for broken relationships, sleepless nights, high blood pressure and ulcers. It destroys friendships, marriages and families, not to mention peace of mind. 'Do Yourself a Favour - Forgive' describes how - properly handled, anger is an alert system that something is wrong and needs to be resolved.Building on her signature message of using the mind to master difficult emotions, Joyce Meyer helps you understand that although life will never be fair, in forgiveness you can deal with the most life destructive and insidious force of all. 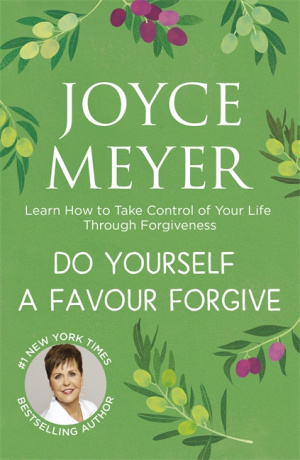 Do Yourself a Favour Forgive by Joyce Meyer was published by Hodder & Stoughton in September 2013 and is our 14051st best seller. The ISBN for Do Yourself a Favour Forgive is 9781444745184. I think perhaps I read this book too far into my journey of forgiveness for it to be of relevance to me, as I did not find it engaging or particularly helpful. Joyce Meyer focuses strongly on the person who needs to forgive being 'angry' and the first half of the book deals with anger - causes of it, emotions of it, masking of it. For someone who has got past the angry stage, or maybe wasn't angry in the first place, just hurt and confused by another person's behaviour and is just keen to move on with their lives and reach a state of forgiveness, the means that much of the book doesn't really relate to their situation. She uses good examples of ordinary people facing hurdles to illustrate her point, people with lives and problems that everyone can relate to. She is also incredibly honest about her own failings and how this has affected her relationships with God and with her friends and family. I found Joyce's style of writing lacked depth - a popular novel compared to a classic - but this style clearly appeals to many. I also found the tendency to intersect scripture quotes with explanations of the meanings of the words frustrating, but again, many people may find this helpful. In conclusion, if you are a person with a lot of anger to deal with, who is in the very early stages of learning to forgive, then this book may help you. For others who know, or have started, on a journey of forgiveness, I would suggest 'Total Forgiveness' by R T Kendall as a more inspiring read. Got a question? No problem! Just click here to ask us about Do Yourself a Favour Forgive.